The Northern Store may sound like a satirical general store that operates in northern communities and is essentially the only game in town for shopping. It’s no SCTV skit, it’s true – there really is something called the Northern Store that serves remote and northern communities in northern Ontario and across Canada. The Northern Store rose from the ashes of the North West Company, a fur trading empire founded nearly 300 years ago by Scottish traders in Montreal. The North West Company merged with the better known Hudson’s Bay Company (HBC) in 1820. In 1987 investors and employees bought out the most remote and northern HBC locations and rebreanded them the Northern Store. This makes the Northern Store the oldest retailer on the continent. 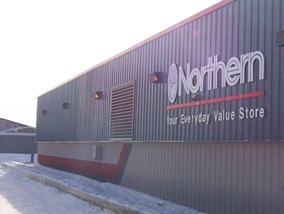 Today the Northern Store operates 25 locations in Ontario. The Northern Store is most prevalent in remote and fly-in communities that are so far north in Ontario that there is no road access. This means that the Northern Store is often the only game in town as far as shopping goes, so they offer everything that you could ever need to buy at all in a normal sized shop. A typical store offers a super broad assortment of food, family apparel, housewares, appliances, outdoor products, bicycles, everything really, in addition to special services like cheque cashing, ATMs, catalogue ordering, money transfers and fast food outlets. All in one store. You get the picture. The Northern Store also produces a line of frozen foods sold by Giant Tiger. I practically lived off those for one of my stints up north. Milk price in 2006 for a fly-in community. 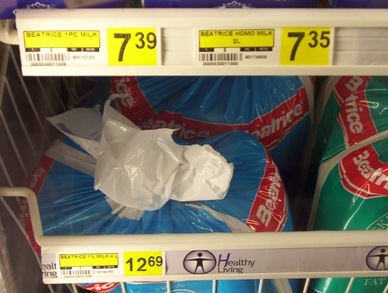 And I get mad when homo gets above $5.00 for three bags! The Northern Store serves communities that are so remote that in most communities every single thing on sale has to be flown-in on small planes, meaning that prices can be high.